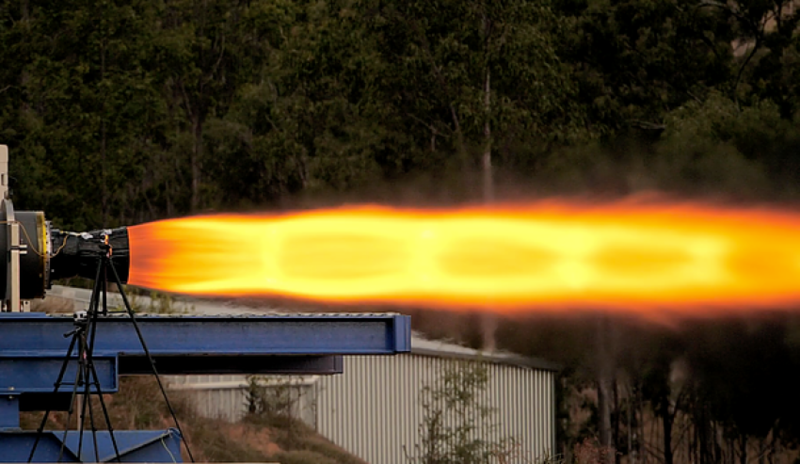 Australian and Singaporean company Gilmour Space Technologies has completed a longer duration test-fire of its proprietary hybrid rocket engine, bringing it one step closer to launching Australia and Singapore’s first privately-developed commercial rockets to space. The test-fire was a 12-second static fire of what will be Gilmour's first-stage orbital rocket engine. Chief executive and founder Adam Gilmour said the test demonstrated stable thrust, and peaked at 75 kilonewtons (or 16,900 pounds) of force. An earlier test in March had generated 70 kilonewtons, reportedly then the world’s largest successful test of a single-port hybrid rocket engine. "75 kilonewtons marks a new record for this engine, and is more than what we will need for our coming suborbital and orbital launches," the CEO said. Gilmour Space is now planning a suborbital test launch in the third quarter of this year, and is working with the Australian Civil Aviation Safety Authority (CASA) to approve the launch from a remote private property in Queensland. 'Eris' is the company's three-stage hybrid rocket dedicated to launching small satellites (up to 400 kilograms) to low-Earth orbit by 2020. "It will also be a test of our mobile launch platform, which we've designed to enable rapid and low-cost launches from remote locations,” Gilmour added. "Interestingly, this capability for responsive launch is one that other countries like the US, Europe and UK are trying very hard to develop right now." This latest test-fire comes just two weeks after the Australian government officially launched the Australian Space Agency and released details of a nine-month space industry review. The report included recommendations to support next generation rocket propulsion systems, and make necessary changes to the Space Activities Act to enable commercial small satellite launches from Australia. "With Gilmour Space's technology and low-cost launch capabilities, small satellite launches could easily be a 'low-hanging fruit' for Australia," Gilmour said. "Our significant progress puts us as one of the front-runners in today's global small launch market, and we look forward to working with commercial, civil and defence partners to build a stronger and more vibrant domestic space industry in Australia and Singapore."